Notes from a panel discussion I attended at an event on accessible transport, hosted by TfL. I attended because I wanted to learn about TfL’s strategic approach to innovation and accessibility. The high-level vision for accessibility on London’s transport: Everyone needs to be able to travel across the capital easily, safely and spontaneously. disability training programme for TfL managers. Disabled people are teaching people who commission and run the services so that they can better understand the impact of the choices they make. No one else in the British transport sector is doing this. Alan thinks this is the most important improvement. Transport exists to get people to a place they want to go. But 84% of disabled Londoners say that transport is negatively affecting their ability to get around and live their lives. We haven’t designed with everyone in mind. Designing for step-free access is one thing, but what about designing for people with autism? Hence the training of managers, and more involvement of people with disabilities in the design process. Alan Benson, Chair, Transport for All. Nick Tyler, Director of University College London’s Centre for Transport Studies. What are the biggest challenges facing accessible transport in London, and how might innovation help? Michael: TfL is more used to working with massive companies than small companies. He’s keen to pave out the route to market for these promising minimum viable products. The commercial and contractual discussion about innovation isn’t trendy, but is super-important. Nick: We need a better ability to test out new ideas. (His research group’s shiny new lab should help with this.) He wants TfL to be braver in encouraging innovation. Hong Kong and Singapore are more innovative than this country. Michael: Singapore introduced universal design principles – trying to institutionalise the right types of design considerations. But Hong Kong and Singapore are more top-down, whereas London is much more bottom-up. e.g. there are 34 highways authorities in London. TfL does have the benefit of London’s size – the city is big, so you can test things out in small parts of it. Alan: Try new things faster. Health and Safety concerns often lead us to hold back from testing things until they’re 100% ready. We could follow the lead of other industries that will launch things that are 80% ready. Ed: Interesting innovations include the use of colour in wayfinding. e.g. Barajas airport in Spain. Japanese train stations play 7 seconds of melody before announcing a train’s departure platform and it cut accidents by 25%. The music settles everyone down a little bit. Nick: We should work to make transport more enjoyable. This will make it more accessible. So look at cafes or playgrounds, and see how you might make things better on transport. This changes your way of thinking from “we need to make this system work to the timetable” to focus more on enjoyment (and, implicitly, value to humans). Nick: To get parents to change their behaviour, teach their kids. Parents listen to their children much more than they listen to the government. How might we have better interfaces between public transport and the rest of the world? Cities are people and we build the infrastructure around them. If we concentrate on building for people, then everything will get better. The income of the bottom 90% of earners in the US has stagnated from 1973 onwards. Pre-1973 growth was more inclusive – the bottom 90%’s income grew faster than the average. Now the reverse is true, with the top 1 and 0.1% growing much faster. Productivity gains stopped following to workers and started flowing to owners of capital. A shift from constructive to extractive capitalism. This has weakened the post-war social contract. Beinhocker sees this as caused by the rise of neoclassical economics and neoliberal ideology and the associated structural changes driven by this dominant way of thinking about the economy and society. This shifted power in the economy, increased power of capital versus labour, and shifted rents to the top of the system. These rents were used to capture the political system. To change the system, we need to revisit the ideas and assumptions behind it. Capitalism isn’t great at efficient allocation, but it’s good at getting people to cooperate at innovate and solve problems. Beinhocker is happy with capitalism in general, just not the current implementation. Prosperity isn’t money – it’s the accumulation of, and access, to solutions to human problems. The purpose of capitalism is to provide solutions to human problems. Markets and governments together create an interdependent evolutionary ecosystem for solution creation and access. Is my solution creating a problem for someone else? Is my solution today creating problems for the future? Human cooperation is fundamental to problem solving. To demonstrate this, Thomas Thwaites tried to build a toaster from scratch. Because cooperation is crucial, and because capitalism exists to solve human problems, then inclusion and a fair social contract are fundamental to capitalist prosperity. I presented at the British Library’s event “Open and Engaged” as part of Open Access week on 22 October 2018, on the value of opening up government data. Here are the slides, which I’ve adapted into the following post, with a post-script of additions generously suggested by the ever-excellent Steve Messer. Why has government opened up data? Probably the first motivation for opening up government data was to increase transparency and trust. The MP expenses scandal led to a political drive to make government and politics more transparent. Data.gov.uk was commissioned by Gordon Brown and overseen by Tim Berners-Lee, and built in in 2009/10. “enable the public to hold politicians and public bodies to account”, “deliver better value for money in public spending” and “realise significant economic benefits”. What transparency data is published? It will have taken a lot of political work to have consistent identifiers between different parts of government, so that this type of scrutiny is possible. Not glamorous, but very valuable – a trend you’ll see more of in data work. Ukraine’s recent reform work is highlighted by its more open online public procurement system. An ecosystem of tools and an engaged community has emerged around this data. Citizen monitoring platform www.DoZorro.org has been used to bring 22 criminal charges and 79 sanctions so far. This takes us to the second big benefit of opening up government data. Open data improves data sharing within government. Previously, having to send a Freedom of Information request to someone else in your own department to access information was a thing that actually happened. Over 400 apps have been created using data from data.gov.uk. Prescription data was used to identify a £200m saving in switching drug brand. UK companies working with open data have total annual turnover of over £92bn. TfL’s open data generates up to £130m p.a. Looking at the datasets on data.gov.uk that are used more, they generally have a clear economic use. These include datsets with information on land and property payments, or information on MOT testing stations. Other popular datasets are more related to understanding society, and are likely used by councils, third sector organisations and other agencies interested in planning service provision – e.g. English Indices of Deprivation 2010 and Statistics on Obesity, Physical Activity and Diet, England. I don’t think the above section was compelling enough. This is because measuring the value of open data is hard. There are a number of different techniques you can use to measure value. None of them are great – either you have something cheap and broad, which doesn’t give deep insight, or you have to commission a deep and expensive study. This post has more thoughts about the value of open data. The UK’s early work on opening up government data has helped set the direction internationally. International rankings are a relative thing, and the rest of the world has been catching up. Some other countries are doing really good things with procurement data. This work is hard – it took Brazil 5 years to get consistent identifiers so that you can link policy to budget to spend. International rankings are lovely, but what do we know about the use of open government data and the challenges associated with this? Metadata is inconsistent and incomplete. Some datasets are published more than once. Data users can only understand how useful the data is once they’ve downloaded it and not all data users have the capability to download and view certain types of data. Competing catalogues, standards, technologies and propositions. Basic data skills and literacy aren’t strong enough to consistently produce data that is findable, usable, comparable and reliable. This means that many of the solutions designed to make data easier to find are only theoretically possible. 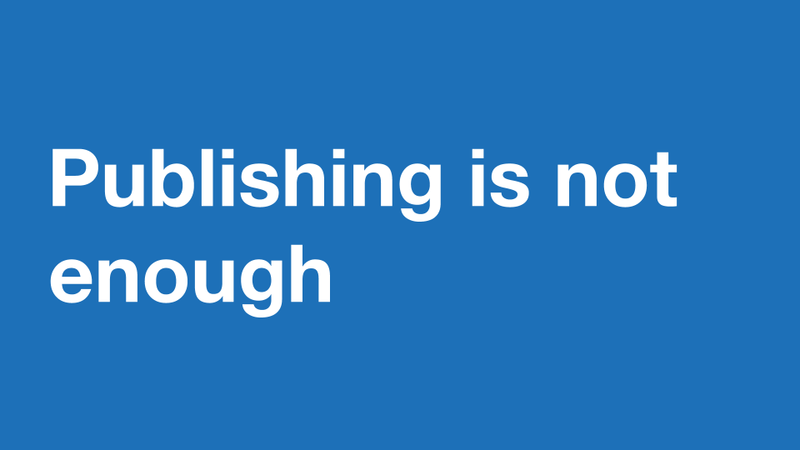 Publishing open data is a crucial start. But it isn’t enough. We need to optimise for use and value. “Availability is only one aspect of openness, and the government also has a role to play in increasing the value of data, through structuring and linking datasets. Linking and interoperability, including consistent schemas. So that you can get network effects from combining datasets. Colocation of documentation and tools to reduce barriers to entry. Organisation for and promotion of use – thinking about how to get value out of the data rather than seeing the job as finished when the data has been published. So reflecting back the use that has been made of data to teach and inspire others, some level of fostering of a community around the data. There’s lots of excitement around the potential of geospatial data. In the UK there’s a newly-created Geospatial Commission looking into how to open up this data. One of its key early tasks is opening up some of the Ordnance Survey’s Master Map data. This looks likely to be on a tiered basis, so free up to a point but paid beyond that. Some highlights of what this Master Map gives include: Building Height data, Water Network Layer. Even here we have the question of linked identifiers. The Geo6 are looking at this. This is the kind of graft we need to get the most value from our data. Transparency and economic value are the key drivers behind government publishing open data. But publishing data is not enough – we need to work hard to understand user needs and maximise use and the value derived from data. They opened up their data en masse and waited for people to use it before improving it. Here’s the original download page and a post by Chris Applegate on why the first release could be improved. It has since been improved thus proving your point about ‘optimise for use and value’. Optimise after you’ve opened it up. The MVP for opening up data is creating a good standard and putting it out there. I once made a timeline of notable events in local gov open data. It’s in this blog post. When government started creating new online transactions, digital services were created, with offline ‘Assisted Digital’ support, so that in theory no-one was left behind and unable to access services. Why did I want to learn about Assisted Digital? Assisted Digital is something that Product Managers are supposed to know about. The DDaT capability framework says that a good Product Manager “Understands the importance of assisted digital” and that a good Senior Product Manager is “Able to identify and implement solutions for assisted digital.” I didn’t know much about it and wanted to learn. Assisted Digital is the 2nd most searched for content in the service manual. Not having a good Assisted Digital approach is a common reason for services to fail service assessment. Most importantly, it’s my responsibility to make sure that this is taken seriously. This fits with our design principles: “This is for everyone” and “Build digital services, not websites”. I’m not currently working on a service, but it’s likely that I will be at some point in the future so I want to be ready. So I did some reading and spoke to some knowledgeable and smart people, including Roxanne Asadi and Ben Carpenter at GDS, who’ve both spent a lot of time working on and thinking about Assisted Digital. How well is government doing with Assisted Digital? In general we’re not doing a great job. Recent Inclusive Services research showed that Assisted Digital channels “are the most likely to be needed by the most vulnerable users, but are the least likely to be switched on or user-centred”. The narrow language of “digital by default” and “digital transformation” often led to a narrow view of service design that saw Assisted Digital as of lesser importance. Allowing the notion of – the phrase, even – "assisted digital" to exist was my worst strategic errors. And Assisted Digital options are needed by lots of people. For Personal Independence Payments, 50% of users were using Assisted Digital. How might we be better at Assisted Digital? Refer to ‘Service Design’ rather than ‘Assisted Digital’. This makes it clear that this is integral to a holistic service, and not a bolt-on. Focus around the user’s needs and end-to-end problem, rather than the mechanics of the service that you’re offering. This seems like the single highest impact strategic move you can make. Include Operations people in designing services – not just Digital people. Otherwise we prejudice ourselves towards digital only, and don’t think about the other channels and implicitly reprioritise them. In government departments, often the Operational people and the Digital people were/are separate teams and directorates. So it wasn’t/isn’t easy to get them to cooperate. Create and share design patterns for Assisted Digital. It should be as easy to reuse designs for a non-digital interaction as it should be to copy a front-end component like a button on a website. Make sure you understand the needs of all your users deeply, including people who don’t have skills and access to digital. If you take this as your foundation you’ll likely do a good job. Iterate and test your Assisted Digital offering just as much as you do your website. Think more broadly about the goals behind our service design, and the metrics we use to measure the success of services. If we just judge services on how many people they’ve moved online, how much they’ve reduced the headcount in a call centre, and reduced costs, then we aren’t giving teams licence to take Assisted Digital seriously. Don’t just build teams of digital specialists to build a digital service. You need operational people as well. Accept that Assisted Digital has a cost. Plan to invest some of the money you save from channel shift to digital in Assisted Digital. Rural Payments. Offered drop-in sessions and home visits. These were cost-effective as they were for a small number of people. Student Loan applications. They found out that about 5% of users needed support. They mapped out how the call centre would take calls and help people, and tested it. They triaged calls and offered a visiting service. The volume was very small so they could pay for this – they just had to retrain people at their existing contact centre. A few months ago Imeh Akpan ran a session for GOV.UK Product Managers going over the Jobs to Be Done Framework. She’s been looking into how we might use it to think about our users better. Jobs to Be Done is about understanding the underlying problem. What’s the differnece between a Job and a Problem that a user has? It adds context: so it includes the fact that someone is driving to work, rather than just being hungry. This kind of contextual understanding helps you improve your product to better solve some known jobs. So in the case of selling milkshake to people visiting a fast food restaurant, optimising the product in its own right – making it chunkier or improving the flavour – was missing the point. When the business started solving for the underlying problem – the real ‘job’ the milkshake was being ‘hired’ to carry out – then sales went up. Jobs to be Done is about user motivations and situations, rather than attributes and characteristics. This is good because those things change, and may not be important. ‘Specialist’ users of GOV.UK are often not very different to ‘Mainstream’ users. I found the same thing at NDCS – the imagined differences between “Professional” and “Parent” users didn’t really hold up to scrutiny. A Job to be Done is the real world goal that the user hopes to accomplish. It’s not a task – those are the steps that someone takes to accomplish the goal, because they seem like the best way of doing so. Take a Job and a Job Story, and you have a Job to Be Done. The Job stays the same, as it’s a deep undelrying need, but the story and the solution can change over time. e.g. You want to become a childminder, drive a car in the UK, become self-employed or fish in UK waters. Examine, influence, appeal what government is doing and the decisions it has made. e.g. Appeal my parking fine, raise public awareness about welfare reform, push government to improve policy-making or change policy. Trigger: Emergency events / data / being told to pay a fine / refusal / minsterial announcement / news / topical events. Current Gig: Senior Product Manager, GOV.UK, Government Digital Service. Current computer: At home: A self-assembled desktop from 2014, optimised for quiet acoustics and now with a 1070 graphics card, or a Asus ZenBook UX305CA laptop. At work: A 13″ Macbook Air. Disclaimer: When you’re applying for a job you spin this stuff into a coherent story. Certainly there are threads you can follow, but the first part of my career was a series of improvisations and desperate expedients. After a few years I’m now in the fortunate position of being in control of where I want to go, and doing a job I love. When we were around 9 years old, my mum and dad were dead against me and my twin brother getting any sort of games console. We learnt our times tables and got a family computer. (I later found out that they were planning on getting a family computer anyway…) Me and my brother played lots of computer games together. Starcraft, Little Big Adventure 2, Heroes of Might and Magic, Unreal Tournament. This probably trained my brain to be methodical and be confident in understanding systems, and sold me on the merits of shared exploration and adventure as only one person could play at once. I went out-of-town to a grammar school in leafy Bucks, and was fortunate to learn HTML. I built my first website on freewebs, about Grand Theft Auto 3. The site had neon text on a black background, character skins that I’d customised myself, car mods, a hit counter and way too many popups. I desperately wish I could share it with you but it seems to have been scrubbed from the face of the internet. Beyond computer games I didn’t really have the confidence, knowledge or interest to dive deeper into what computers could do so this thread lay slightly dormant. Having originally assumed I’d wanted to do a PPE degree, I decided that history was more my thing. It’s varied, has lots of interesting stories, and is all about people living through whatever situation they find themselves in. I tried my hand at economic history, political history, social history and cultural history. Turns out I really enjoy cultural history and medieval history. In hindsight this degree was exemplary training to be a Product Manager – you have to rapidly master a new topic and communicate clearly and confidently about it. It trains you to be a bit of a renaissance person, interested in diverse things and with a bit of a sense of adventure. I spent hours each day in studious solitude in various libraries, but also spent a couple of hours each day in excellent conversation with other people in my college over lunch or dinner. That ability to dive deeply into someone’s domain of expertise and get to know how it works, what they care about and what they find difficult, was drilled really well by this. During this time I assumed that I wanted to be a museum curator. I’d done a bunch of volunteering at the London Canal Museum, working on stuff like an audio tour of the walk from Camden Lock to Islington Tunnel, and a series of audio installations in the museum. In the summer before my final year at uni, I remember a chat with the chairman who advised me that there weren’t really any jobs to be had in the sector. I also reflected on the demographics attending museums and thought that I might be able to have a wider impact doing something else. But I wasn’t sure what that was. This was a useful if poorly-timed rethink. I left uni without a real plan. I applied for lots of things, including being a radio weather reporter. I came within a hair’s breadth of becoming a trainee television creative, coming up with gameshow concepts. (Apparently some of the concepts I pitched were a bit high-brow. An acceptable rejection.) I nearly ended up working in policy in the charity sector, which is what my twin brother does now. I’d done a fair amount of digital communications for university societies, just as social media was taking off. A meetup with an old teacher of mine, now working in medical education, pointed me in the direction of an opportunity to use these skills on the creation of an online learning community for training doctors. It felt like a break so I packed my bags and moved to Kentfor the contract. I didn’t know about agile, or about user needs or iterative design at this point, but I gave it my best shot and started learning more and more about how the different parts of digital fit together. I was working on all aspects of the site, alongside a developer, so built my understanding loads. My manager was excellent at helping me understand the politics as well. From here I did digital projects and digital communications jobs for a while. I remember one early job, finding out that a ‘web editor’ role in practice needed a firm technical understanding of how website backends worked. I got in touch with my friend Andy Jones, and he talked me through everything in a call that same evening. If ever I’ve been generous with someone else in helping them understand something technical, believe me when I say I’m just paying it forward. I moved around quickly, much of this as result of the financial crash and funding cuts causing difficulties for the charity sector. Admired GDS since 2013 and was delighted to join in 2017. A standard weekday starts with a half-hour checking up on emails and Slack before a standup with the first of my teams at 09:45. We take ten minutes or so to run through work-in-progress, coordinate activities and discuss any blockers. I repeat the process at 10:00 with my other team. As a Product Manager my job is about making sure that we’re solving the right problems, that we’re adding as much value as possible, and aligning around the right vision. Day-to-day this means that understanding, assessing and communicating purpose is my role. So I’ll be making value judgements on how to approach certain areas of work – whether to gold-plate a feature or do something basic, for example, or which from a set of options to work on – either with my team or solo. I’ll spend most of the day going from meeting to meeting – which sounds ghastly, but actually is a series of interesting chats with intelligent and motivated people, diving deep into interesting problems. I love working with the different specialists in my teams, and it’s a real brain workout. I do sometimes regret that I don’t carve out more time for solitary intellectual activity, diving deep into a puzzly problem, but if I had to choose, I’d take the group approach every time as it feels more dangerous and collaborative. When I’m at my desk, I’m usually doing some form of written communication with someone not in my team – a user or stakeholder in another government department. There’s an interesting tradeoff here between ruthless prioritisation of your time, and maintaining relationships and being diplomatic. As a Product Manager, lots of people want your input, or for your to do something for them. So you also spend a lot of time politely saying no to things. We pause our working day at 3:45 for 15 minutes to have fika – a break for coffee, cake and a chat. (Sometimes just the final one). The key thing is that it’s a non-work environment, so we have an actual break and people can get to know each other. I feel at home wherever my desktop computer is set up. I put a lot of value on having something that can play music. Sometimes not doing a thing is the best approach. I insist that every card on my team’s trello board has a ‘What’ and a ‘Why’in its description, so that anyone can understand the purpose of the work. “Can you get a What and a Why on that?” has become a sort of joke catch phrase but I’m okay with that. It makes sure that everyone in a multi-disciplinary team understands the purpose of everything that is being worked on, and it trains people in communicating beyond their own specialism. Google calendar for solo tasks. Trello cards for things I’m working on with my teams. I’ve tried the Getting Things Done framework, but when things get busy I’ve found it too brittle. I take notes of things to do on post-its and stick them to my laptop. I triage them to something electronic within the hour. My Social Summary. I built it from the ground up (that’s why the front-end looks rubbish ;)) and I learnt loads. It’s now a paid-for product. For £3 a month you get a daily (or twice daily) summary of the best material shared by your twitter network. I’m also proud of the technical work I did on a creative project with my ex-girlfriend. I set up most of the standard things that a competent developer would do: version control, automated testing, a decent build pipeline, programmatic creation and destruction of review applications. The product idea was a fun and interesting one, and I got to play around with a few different APIs. For work-type reading, I’d recommend “Turn the Ship around” by David Marquet. It’s about intent-based leadership and how you can give people space to do great things. In knowledge work you need to lead this way, not in a command-and-control fashion. The novels that have impressed me most as an adult are probably Nabokov’s Pale File and Paul Auster’s New York Trilogy. Some of the Lead Product Managers and Heads of Product at GDS and across government. Notes from a talk by Marty Cagan, at a Product People meetup hosted at Geovation on 19 October. Marty Cagan is from Silicon Valley Product Group has worked at places like Netscape and eBay back in the day, and advises lots of startups on how to do tech product management. Tech teams exist to serve ‘the business’. We set up teams to serve actual customers, meeting their needs in a way that they love, but in a way that meets the need of the business. Why don’t most organisations do this? Trust. Senior management don’t think that they can trust subordinates with decisions. They think the people aren’t capable. Product vision – a north star aligning every discrete product team in the organisation. Needs to be inspirational. It’s the main recruiting tool. Product strategy – the plan for getting from the current state to the desired end state. Not a product roadmap – more a sequence of big milestones. Product principles – princples to help you make difficult product decisions. e.g. at eBay resolving the fact that the seller team had a lot of power, and that could lead to buyers being treated worse. So eBay established a principle of always favouring the buyers, because if you take care of the buyers then the sellers will come. “It doesn’t make sense to hire smart people and then tell them what to do; we hire smart people so they can tell us what to do.” – Steve Jobs was negative, but he didn’t tell people how to fix things. He gave them space to do that. Staffing. Put the right people in place and don’t set them up to fail. You need to get the right competencies in the team. Trust needs competence and character. Often managers don’t know or understand the needed competencies. The All Blacks have a “No Dickheads” rule. They’ve kicked players and coaches over this principle of character. “Cultural fit” is a bad thing to recruit for because it leads to hiring people like the people you already have. The best way to recruit is to go for competence and screen out the jerks. The team is accountable for solving the customer or business problem (i.e. delivering an outcome). Leadership gives the objectives – e.g. make the churn rate better. The team gives the key results – e.g. saying that we think we can do a 10% improvement. Teams can suggest objectives, but the organisation needs to think about coordinating and prioritisation organisation-level objectives, so needs to drive this process. Are they tackling the big risks up front? (value, usability, feasibility, business viability) PM responsible for making sure that we resolve these risks (or at least well enough) before we write production code. Are they collaborating closely around the problem, rather than passing it around between disciplines? Not about implementing features, it’s about getting results. shipping things on time and budget is not important – it’s about getting results. time to money is more important than time to market. Aspiring Digital Product Managers often ask me if they need to know programming to do their job. I always used to say ‘no’, but now I’ve changed my mind. As a Digital Product Manager, you own the value and purpose of your team’s work. You are responsible for the vision and the ‘why’. Understanding ‘how’ is the job of your colleagues who are all focused on delivering the vision. You are never going to be an expert in all the domains of practice in your multi-disciplinary team. You shouldn’t be. You’ve hired designers, user researchers, performance analysts, developers and data scientists to be experts in their craft, so give them space to own their specialism. So a Digital Product Manager should never write code at work. But I think that you should be able to write some rudimentary code, having had a serious play around, because it will help you think better as a Product Manager. As Product Manager you should have a sustained critical engagement with the core domains driving value for your product. And you should be interested in the frontiers of value in your team’s work. If you’re a Digital Product Manager that probably means learning about digital technology. You don’t need a computer science degree or technical background – a humanities degree is a strong fit, given the need to understand what ‘value’ means in a number of different domains, and to synthesize, integrate and communicate this understanding. What matters is curiosity, excitement, optimism and a lot of dour pragmatism. When working with a user researcher, you don’t tell them how to do their job. But you know the types of question to ask, and how to interrogate and work with the answers. You need to be able to do the same thing with technology – you can’t just leave it as a magic black box. You need to be able to critically engage with software engineering to at least the same level of competence as the other specialisms in your team, and probably more, given its central role in defining what is possible. What’s special is that your engagement is focused on value rather than delivery. Explore, ask questions, and continually think about how this domain might relate to the problems that your product is trying to solve. Some practical next steps: If you want to be a Product Manager, learn what a function is, have an appreciation of boolean logic and ‘if’ statements, get your hands dirty writing some poorly laid-out code and deal with the consequences, play with an API or two to see the kind of value they provide, store some material in a database, play around with something that you find fun and interesting. I’ve written some guidance on learning programming here. There might be other specialisms in your team where your knowledge falls a bit short – such as data science. Take the same approach there. 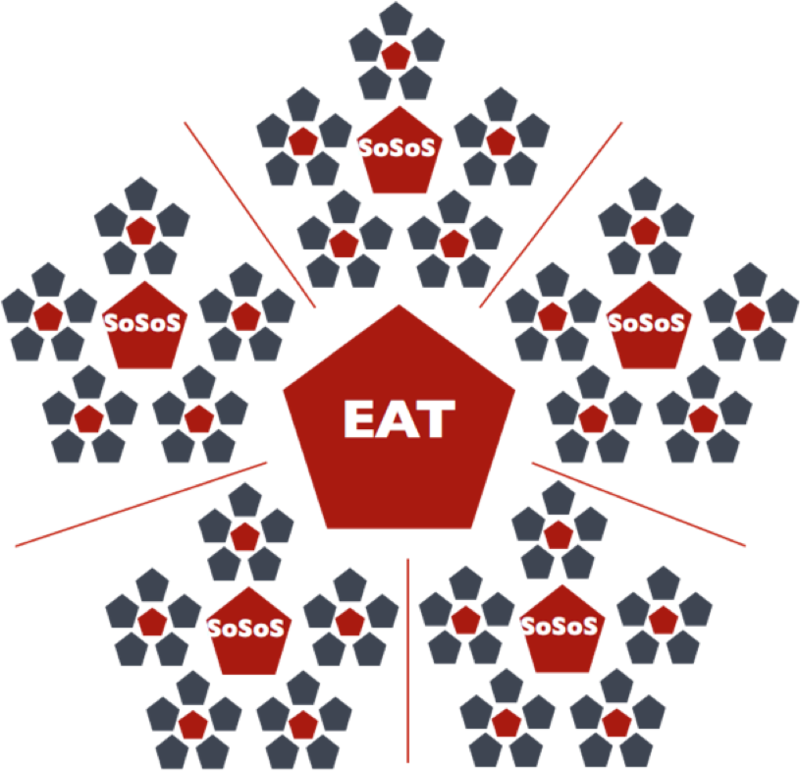 Yesterday’s Digital Project Managers London meetup looked at the Scrum @ Scale framework. The event was mostly questions and answers, so what follows is a blend of that material, bolstered with content from the Scrum @ Scale website. The goal of Scrum @ Scale is to allow organisations to scale effectively, rather than finding diminishing returns as growth leads to complexity and confusion. So it’s solving a higher level problem than the Scrum framework, which is focused on individual teams. The Scrum @ Scale framework is deliberately minimalist. It’s a “minimum viable bureaucracy”. So you can build what you need on top of it to fit your culture or existing practices. 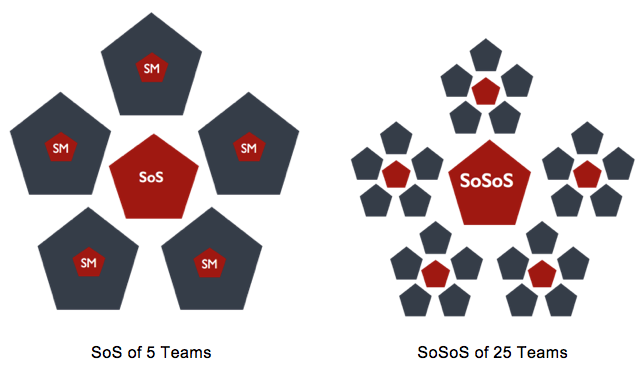 The key point is that you have scaled daily scrums going up the organisational hierarchy. Issues that can’t be resolved at one level are taken up a level. You have scrums, scrums of scrums and (if you need it) scrums of scrums of scrums. 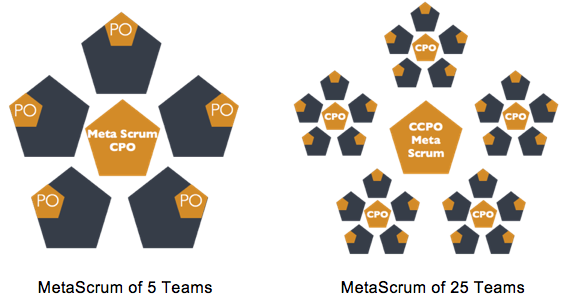 The scrums above the normal scrum are delivery focused – so made up of Scrum Masters or Delivery Managers. Focused on the ‘How’. This Executive Action Team has a transparent backlog and ideally daily standups. It’s responsible for the transformation backlog and for the quality implementation of Scrum in the organisation. There’s an equivalent Product Owner / Product Manager framework, focused on the ‘What’ and the ‘Why’. It includes key stakeholders, not just Product people. On a sprint by sprint basis you have coordination of backlog prioritization at each of these levels. Create and express an overarching product vision. 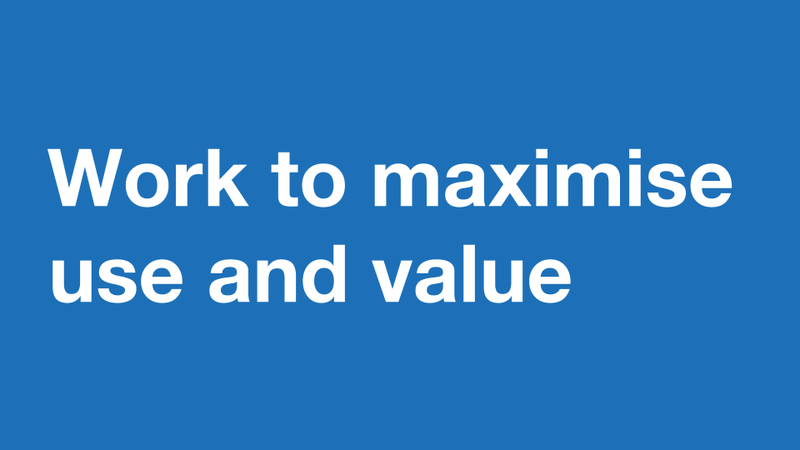 Build buy-in to the prioritised backlog. Create a shared definition of done that applies across scrums of scrums. The Chief Product Officer sets strategy and vision for the product. 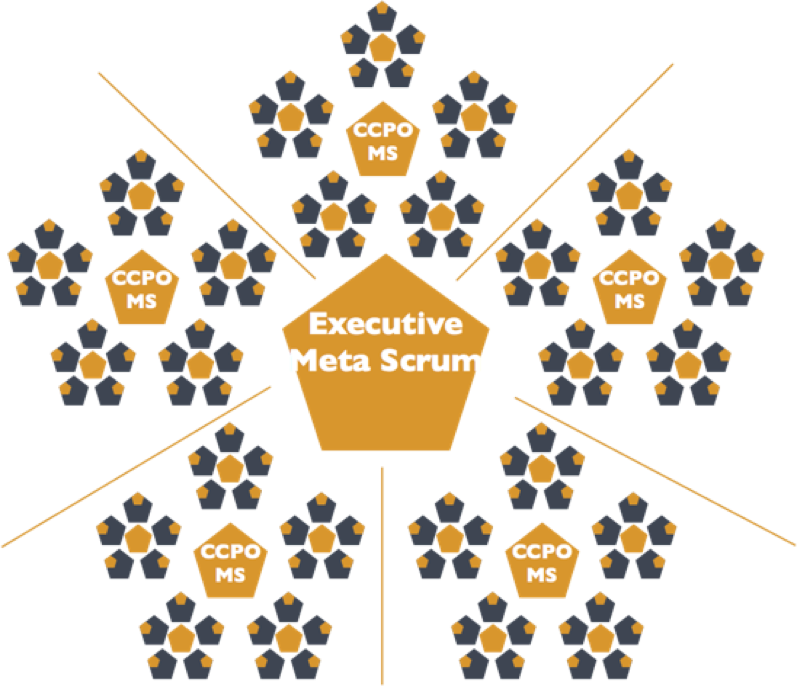 MetaScrums can scale up like Scrums of Scrums can. You get up to the executive meta scrum level. At this level, organizational vision and strategy is set, aligning all teams around common goals. Posted byMartin Lugton 9 August , 2018 10 August , 2018 Posted inevent summariesLeave a comment on What is [email protected]?